Did you see the Giants last weekend? Did you love it? 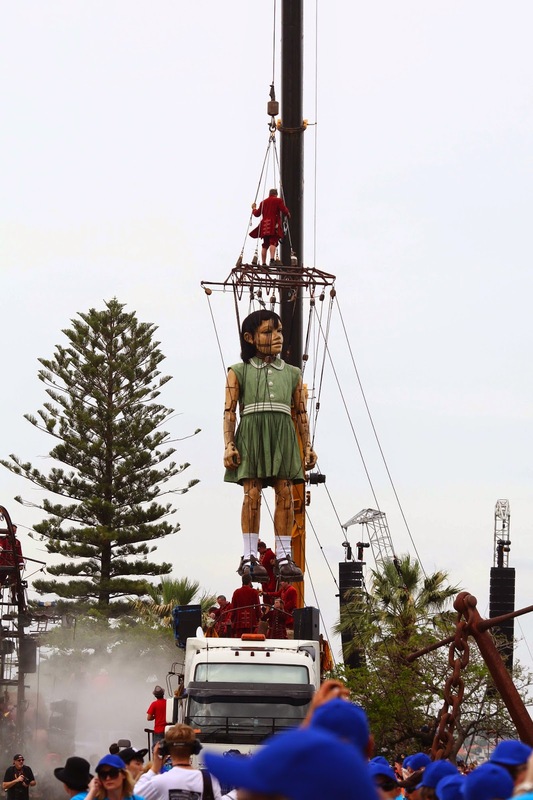 I went on the Friday morning, just to have a quick look, and ended up staying all day, following the Little Girl Giant around. It was one of those things you can't really capture with photographs. The excitement and buzz, kids shouting "she's moving!!! ", the beautiful music, getting sprayed by water from the boat... and that inexplicable feeling when she looks at you, tilts her head, and blinks. I was taken away by it all. The crowds were large on Friday, but really well behaved. Everything was organised flawlessly. I didn't get to see the Diver on the move (I saw him asleep at the train station though) but it must have been an amazing site given he was even taller than the Little Girl. After it was all over, I felt kind of sad. Like when a friend comes to visit but inevitably has to leave. But I hope the Little Girl is enjoying a new adventure in a different city now. Maybe having a rest, taking in some scenery, making new friends... and maybe one day she'll visit us again?